Born with magic, Jon never asked the cost. His dad vanished. Monsters lurked in the dark, waiting for him to notice, but as long as he kept his eyes forward, as long ad he pretended to be a normal human, they forgot he was even there. Until they didn't. 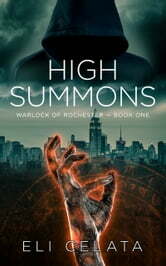 Ruthless rogue wizards and hordes of demons flood the city. Put in the cross-hairs of a demon hunter, Jon jumps at the chance to apprentice, but the demon hunter, Jordan, didn't show up by chance. He's got his own agenda in Rochester, and dealing with a group of rogues desperate enough to set the city ablaze is just the beginning. Wild nights drag Jon deeper into the world where his father vanished. Maybe he's becoming an addict. High Summons is the first book in the Warlock of Rochester Series and is an intriguing read that leaves the reader eager to resolve the mysteries surrounding University of Rochester student and half human, Jon, and his developing magical abilities. What happened to his demon hunting father? Why didn’t he train his son to use magic? Will Jon follow in his footsteps, anyway? Up to this point, Jon has considered his magic a friend and a refuge, something for him alone, but he convinces a visiting demon hunting wizard, a spiky haired young man not much older than himself, to begin training him on the classes of demons, magic users, and how to harness Jon’s own powers. This new version of the world, one where a demon might lurk around any corner, tap on your window, or attack you draws Jon away from what had been the most important parts of his life: his classes, friends, and mother. It starts a little slow, drags in a few spots where there’s a lot of information presented in single chunks, and it took me awhile to warm up to the characters, but it was a fun read and I look forward to reading the rest in the series.